Organizer: ICS Convention Design, Inc.
Laser is one of the most anticipated technologies for advanced material processing including micro and 3D, both for metals and non-metals, where other technologies have seen difficulties. Today, laser plays an irreplaceable role in variety of applications. This includes green devices such as solar cells and LEDs, advanced electronic devices such as smart phones, and medical devices such as stents, and even vehicles and air-crafts. 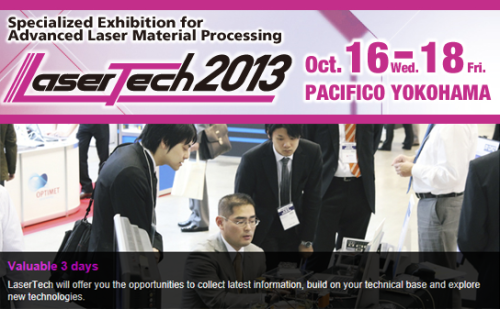 LaserTech is a comprehensive exhibition that showcases and introduces technology, products and services contributing to advanced laser material processing including marking, welding, cutting, drilling, surface treatment, micromachining and rapid prototyping. In addition to exhibition, seminars and conferences related photonics industry will be addressed. The seminar focuses on the advanced industrial laser material processing which plays an inreplaceable role in various industries. Industrial Laser Systems, Industrial Lasers (CO2; Lasers, Solid State Lasers, Excimer Lasers, Diode Lasers, Fiber Lasers, etc. ), Laser Parts and Accessories (Optics, Cooling Equipment, Flashlamps, Gases, Safety Equipment), Positioning / Motion Systems, Laser Power / Energy Meter, Processing Software, Laser Processing Contract Service etc. Electrical / Electronics / IT Devices, Semiconductor Equipment, Medical / Dental Instruments, Transportation (Aerospace, Automotive, Aviation, Shipbuilding), Other Metal / Non-metal Processing etc.